In 2004, George Goens lost his daughter during the birth of his second grandchild. How does one respond to the simultaneous crash of life and death? 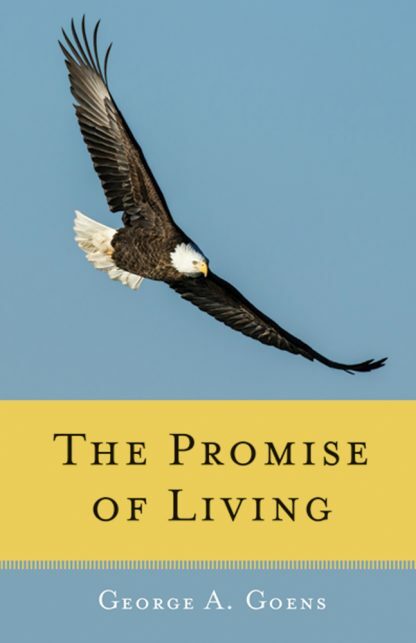 In The Promise of Living: Loss, Life and Living, Goens wrestles with his conflicting emotions over the convergence of two very disparate events � one celebrating the beginning of life, one grieving the loss of another. Goens begins his story at the expected date of his daughter Betsy�s birthing of her second child, Luke � his grandson. Goens� joy slowly twists into panic, then horror when phone calls from his son reveal that the process has gone awry. Stricken by a rare complication, Betsy delivers a healthy baby but dies soon after the birth. Thus begins Goens� journey of grief, anger and despair as he struggles to reconcile the paradox of his daughter�s premature passing juxtaposed to the developing life of his grandchildren, their family and his own life. He comes to realize that, even while living in a community with family and friends, everyone must ultimately face loss alone in the quiet of their own hearts and souls. �Life�s only script consists of birth and death,� Goens writes. �We fill in what comes between. . . .Whimsy and mystery, serendipity and surprise fill our lives. The clich�d story of a main character succumbing to tragedy, falling into a funk, having an epiphany, and seeing the light and then proceeding back into normalcy doesn�t really happen. . . . Finding peace takes time and is a creative process of small steps, plateaus, and setbacks,� he adds. One�s sorrow is in direct proportion to one�s love for another when they are gone. in celebration of your beautiful and endearing life. In spite of heart-wrenching circumstances, Goens and his family find a way to heal through acceptance and forgiveness, and he honors the life of his daughter by living his own to its full potential. Readers who have experienced their own devastating loss � or who are close to someone else who has � will find comfort, inspiration and wisdom in his story. George A. Goens, Ph.D. is a prominent author, dynamic leader, recognized educator, and featured speaker. George has worked with public and private sector organizations on leadership development, and assessment, and has presented seminars and workshops on leadership and educational reform for regional, state, and national organizations and for school districts across the country. He is the author of five books including Mastering School Reform, Getting the Most from Public Schools: A Parent�s Guide, Soft Leadership for Hard Times, Leadership for Turbulent Times, and Letters on the Promise of Living. In addition, he has published over 60 articles in national and state periodicals.